Disclaimer: This post is on behalf of Groupon Coupons and I have received product and/or monetary compensation in exchange for my participation. All thoughts and expressions contained in the post below are 100% mine and mine alone unless otherwise stated. Please do your own research before using or purchasing a service or product as your results may vary. We're all familiar with Groupon and their numerous discounted goods and services in every state in the United States and even abroad, am I right? I don't know many people who don't know what Groupon is these days; it's most definitely on it's way (if not there already) to becoming a household name and such a fantastic way to save money. In fact, I have a baby shower coming up in May and one of the stores she's registered at is Target. Wouldn't you know there was a Groupon for a Target gift card that popped up not more than a week or so ago. Spend $10 and get a $20 gift card, essentially 50% off. Something I did not know until just recently and you might not have either: Groupon Coupons. While Groupon helps you save money on goods and services around the world Groupon Coupons goes a step further and helps you save at the stores you like shopping at the most, boasting 64,553 FREE coupons at 9,880 different stores. So essentially Groupon has you covered if you want to visit a local spa on a budget or buy a particular product you've been eyeing at a discount, and now they have coupons to save you even more money while shopping in store OR online. Not only do I have a baby shower to go to this Spring but I also have a wedding two weeks later! I have my dress for both already but I need an awesome pair of shoes to compliment it and the JCPenney $10 off $25 order coupon is perfect; I can buy those gorgeous a.n.a red microsuede wedges pictured above on their website without feeling too guilty. Truth be told they come in black too and both colors would work just fabulously with my dress, I just have to choose. Or do I? May is a busy month for me so maybe after all is said and done I'll look into what kind of money saving deals Travelocity offers so I can go on a much needed vacation! A tired girl can dream, right? What store do YOU hope is on the 9,000+ list? 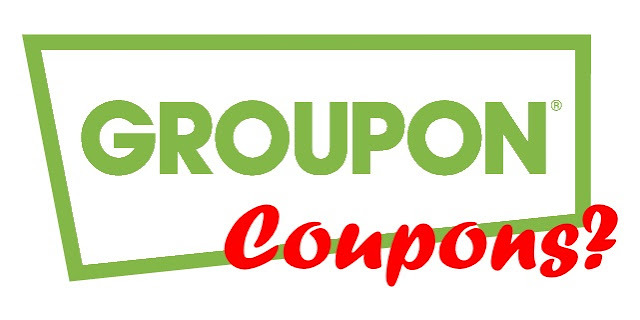 We use Groupon for everything from food and travel to Groupon goods and coupons! It's amazing what you can find and save on with a little help from Groupon! I'm just discovering the fun that is Groupon. The hubby and I hope to take some little trips and there are a lot of coupons for cities not too far away from me. Go for the red shoes! I love Groupon, and I love that their deals are so varied ... recently I bought a couples massage Groupon for my bf and I (his birthday is this week) and also a ghost tour Groupon for when I'm in New Orleans in June, for a friend's wedding! I did a ghost tour in Savannah a few years ago too. I've never used Groupon before. I checked them out and was excited to see quite a few deals on yoga classes in my area. I've only used Groupon a few times but it has been so helpful! I like finding local restaurants on there. OK for some reason I did not know Groupon did anything besides events spa days and stuff like that. I'm totally checking out I cannot wait to see what I can save on. I hope I find coupons to some of my favorite stores on Groupon Coupons too. I love finding deals! Target, TJ Maxx and Michael's are three of my favorites. Having some Groupon Coupons deals makes shopping there even better! YES to Groupon Coupons!! I have found some amazing deals with them so far!! I love when Groupon has the Starbucks gift cards for cheaper than they really are! Heck...I can't pass up a good deal! Groupon is awesome! It's one of the best ways to save money especially when you're under a budget. Thanks for the info about new things that groupon offers! That's so helpful. I think anything to save money is a good thing! I am new to Groupon but learning to love it each day! Thank you for the great post! Money savers indeed! So love this. Amazing GROUPONS. Something great to investigate. Groupon is amazing and Groupon Coupons sound like they make it even better if that's even possible. I love Groupons! Always good finds! They have way more than I'd have dreamed. I really like Groupon. I love coupons. I am not a Groupon'er. I may have to become one though. I just started using Groupon and I wish I had started earlier. I kept saying I was going to check it out but I always got busy or forgot. Of course! That's one of the reasons why we use groupons -- to book travel and restaurants for a cheaper price! Using groupon is very economical. I have heard so much about Groupon, but have never used their service or utilized their deals. I know, hard to believe! And now I am kicking myself because getting a $20 gift card for spending $10 is an amazing deal!